Testimonial - Feedback Dogs for Good. Following my visit to a recent event organised by Banbury Chamber of Commerce at Dogs for Good, in Banbury – I was so touched by the work they are doing around the country, that I just had to help them out in their hour of need. Dogs for Good is a growing charity in located Banbury and have been having some building work done. I put a request out on social media to see whether any local businesses could help us with some of our furniture needs, and Neil replied so quickly! 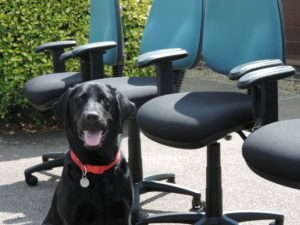 He immediately offered to donate five brand new office chairs and of course we were delighted to accept. 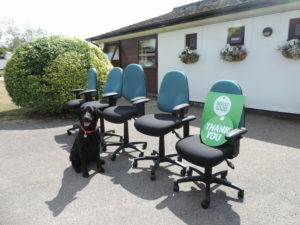 Being supported by local businesses like Work Area Ltd is so important as it means that we can spend our funds to make life-changing differences for people with disabilities through a partnership with a trained dog. Other local organisations and individuals also offered to donate items so we really were so thrilled with the support we’ve had.